What is FCS Educator Day? The annual Family and Consumer Sciences (FCS) Educator Day celebration will take place on the Wednesday of FCCLA Week. For 2020, the event is being celebrated on Wednesday, February 12. 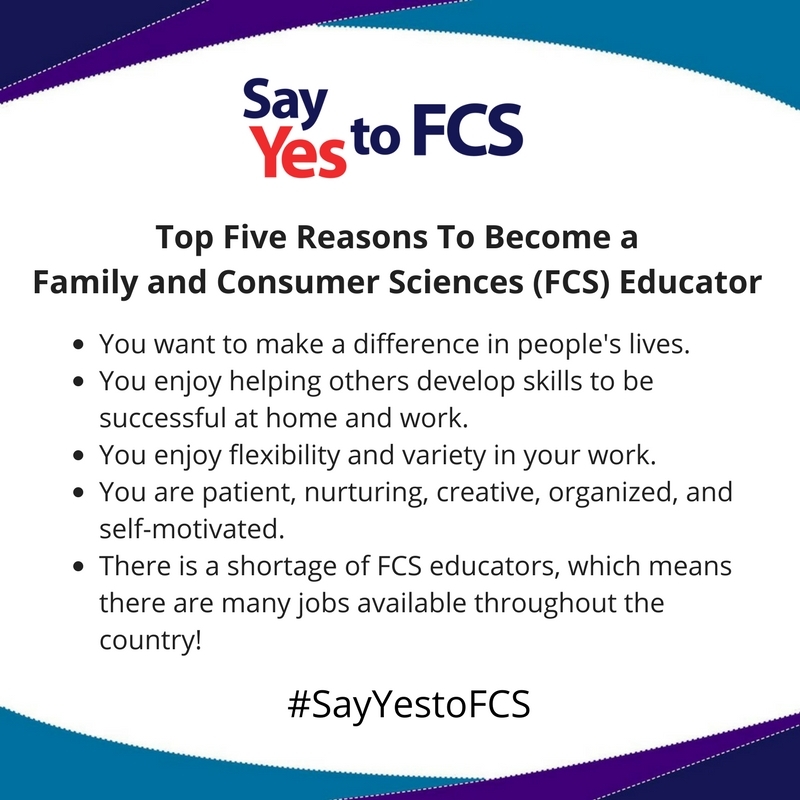 FCS Educator Day is designed to encourage others to become FCS educators and to recognize and celebrate the important role that Family and Consumer Sciences educators play in our schools and communities. FCS Educator Day is a part of the Say Yes to FCS: Filling the Educator Pipeline recruitment campaign, an initiative of ten FCS organizations. encourage students to consider careers as FCS educators. Anyone who wants to participate can find a variety of resources to help them talk about FCS education at www.aafcs.org/sayyes. What Happens on FCS Educator Day? FCS educators and FCS education advocates (parents, alumni, business and industry leaders) will engage in a vareity of activities to celebrate and promote the career of FCS education. These activities may include school rallies, special lessons, community activities, and much more. The Say Yes to FCS Educator Recruitment website is a clearinghouse of resources to help current educators, prospective educators, and advocates. Resources include videos, lesson plans, social media tools, and more!